A group of commission agents from different parts of the state have allegedly duped a number of unsuspecting farmers of crores of rupees. While the latter are knocking at various doors to get justice, the agents have allegedly declared themselves as bankrupt and settled in different states. The District Consumer Disputes Redressal Forum has issued bailable warrants against a dry cleaner, S. Verma, of Ghumar Mandi, as he failed to appear before the forum despite directions. Before this the consumer forum had issued notice to the dry-cleaner for explaining the reason for not complying with its orders. Residents in several city localities, including Karamsar colony near Basti Jodhewal and a couple of colonies on Tibba Road here continue to live under a constant threat of outbreak of waterborne diseases even as the number of cases of jaundice and gastroenteritis respectively in the two areas, were on the wane. Badly hit by long and unscheduled power cuts, the dyeing industry in Geeta Nagar, Tajpur Road, has urged the government to resolve the problem of poor power supply and transfer electric load from domestic feeder to industrial feeder. Students of degree classes of various colleges in the city are in a fix over the dates of practical examination. They alleged that they were intimated about the dates of practicals a day before their examination. About 20 students of Kundan Vidya Mandir (KVM) had a providential escape today as the brakes of one of the school vans failed near Harkishan Public School, Dugri. Worried parents, on getting information, rushed to bring back their wards. Gurinder, van driver, sustained minor injuries while the windowpanes of the van were broken as it smashed into a trolley. Avninder Singh (19) son of Ishwinder Singh of Guru Teg Bahadur Nagar Jagraon, student of Baba Ishar Singh Paramedical Institute, Kot Isse Khan was killed. The International Human Rights Organisation (IHRO) has decided to take up the cause of debt-ridden Punjab farmers, committing suicides. It would convene a meeting of all factions of the Bharti Kisan Union (BKU) and other farmer groups in the state and plead this case before the National Human Rights Commission (NHRC) that had already taken cognisance of the cause of Andhra and Kerala states’ farmers last year. The Deputy Commissioner, Mr Anurag Verma, today said that ‘surface-flow constructed’ wetlands will be set up in 12 villages in the district. Elaborating on the scheme, he said, this was a rural sullage management technology system consisting of shallow ponds wherein water flows over the land planted with Typha. Activists of the Rashtriya Janata Dal (RJD) today a marched from G.T. Road to the Mini Secretariat here and presented a memorandum to the district authorities, demanding an end to exploitation of workers, maintenance of law and order and checking unemployment in the state. Sanjeev Kumar, a look-alike of fast bowler Irfan Pathan, returned home disappointed as he failed to meet Pathan during the Indo-Pak Test match at Mohali. This young chap still wants to meet Pathan. On the last day of the match, Rameez Raja, a former Captain of Pakistan, and Inzamam-ul-Huq, the present skipper, acknowledged him as Pathan. Sourav Ganguly was in a fix when he met Sanjeev after the match ended. 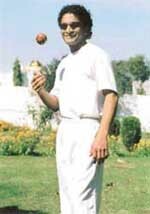 Sanjeev Kumar, a look-alike of fast bowler Irfan Pathan. The Central Excise Commissioner here has directed all assessees of Central Excise and service tax that duty and service tax for 2005 or for the quarter ending by March, may be paid by March 31, 2005. The Raikot police today claimed to have recovered nearly seven quintals of poppy husk valued at over Rs 2 lakh in the market. The police arrested one alleged narcotic smuggler who was bringing it into Raikot from Rajasthan. Residents of Kanganwal village have urged the authorities of the Punjab School Education Board to investigate an incident in which a flying squad team had tried to relieve the staff at an examination centre allegedly on flimsy grounds. Another team, which visited the centre at the same time, had reported the centre to be running smoothly. The board authorities had, however, directed the district authorities not to shift the staff. Following a complaint lodged by the Joint Action Committee (JAC) of the employees and teachers of Punjab Agricultural University (PAU), the Ministry of Environment and Forests, Government of India, has ordered an inquiry into the felling of a large number of trees in the main PAU Campus. In order to fulfil the long pending demand of setting up a suitable memorial of Shaheed Sukhdev, the state government has decided to rename Government Girls Senior Secondary School Bharat Nagar, as Shaheed Sukhdev Thapar Memorial Government Girls Senior Secondary School. The annual prize distribution function of Master Tara Singh College was held today. Dr K.N. Pathak, Vice-Chancellor, Panjab University, Chandigarh, was the chief guest. The function started with recital of shabads. Ms Madanjit Kaur Sahota, Principal, welcomed the chief guest and read the annual report of the college. She highlighted future plans of the college. 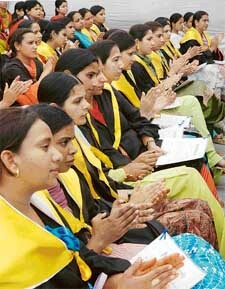 Dr Pathak in his address stressed the need for educating girls. The Annual Prize Distribution Function of SDP Senior Secondary School, Basti Jodhewal, was held here today. 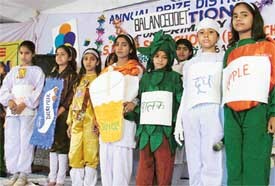 Mr Balraj Bhasin, President of the SDP Sabha was the chief guest on the occasion. “WILL to Win” is the motto of GMT Senior Secondary Public School. The motto inspires both the students as well as teachers. The students are inspired to inculcate the spirit of sacrifice, devotion and dedication. Education has a multi-faceted role to play in a nationwide effort to intensify human resource development. The main task is to strengthen the base of the pyramid which constitutes a billion people. More than 50 per cent of the population has heartburn. Heartburn is even more common during pregnancy, with about one in four women reporting it daily at some point during their pregnancy. Heartburn is a burning feeling in the middle of the chest caused by acid leaking upwards from the stomach into the esophagus, or swallowing tube. Thanks to fine batting by Salil (55) and Deepak (39), Municipal Corporation Club recorded 40-run win over Unique Club in a cricket match played here at the Satish Chander Dhawan Government College ground. In reply to Municipal Corporation Club’s total of 171 runs, Unique Club could gather 131 runs.